Rick Schmidt has written, directed and produced over 20 features which have premiered at major national and international film festivals all over the world, including Sundance, Berlin and London. His notorious filmmaking how-to books, Feature Filmmaking at Used-Car Prices and Extreme DV at Used-Car Prices have influenced countless up-and-coming filmmakers and many noted indies, including Kevin Smith and Vin Diesel. “Without Rick’s book, Clerks would have been an idea that never made it past this page.” –Kevin Smith, Writer/Director, Clerks, Chasing Amy, Dogma, etc. 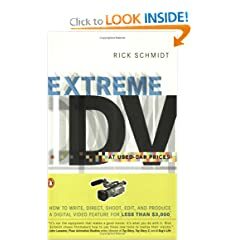 “Rick Schmidt shows filmmakers (in Extreme DV) how to use these new tools to realize their visions” – John Lasseter, Writer/Director, Toy Story, A Bug’s Life, Cars, etc. In the following interview, Rick Schmidt offers priceless filmmaking how-to advice for any filmmakers who want to make their feature now, without waiting around for Hollywood to give them permission. Rick, thanks a lot for taking time to join us today. It’s a real honor to chat with you. Thanks Jason. It’s great you’re keeping the ‘film’ beacon burning in the middle of all this, and encouraging DV moviemaking as well! I can remember getting your book, “Feature Filmmaking at Used-Car Prices” as a Christmas gift some years ago. After reading it, I was so inspired to make a feature, that I spent the entire next summer mopping floors and cleaning toilets to save up for a used Arri BL 16mm camera and film. I bet I’m not the only filmmaker who has been inspired by your work. Did you ever think your book would become such a staple for the up-and-coming filmmaker? At the time I didn’t really know what the book would amount to, beyond bailing me out for huge debts at the lab! First of all, I was happily shocked when it sold to a good publisher(!). And then, once I got paid, I was relieved that I finally had some cash to pay debts, get my wife out of a lousy job, and maybe keep making movies. Actually I didn’t really understand the book’s total effect until internet came into existence around the time of 2nd edition (1995) and I began to get lots of e-mails from readers. Got over a thousand notes over a couple year period, telling me how readers were jumping into no-budget feature filmmaking. I think I was one of them! Sounds like you’ve empowered a lot of filmmakers to make their feature. Been wondering… What has happened to all those unknown features? It seems like somebody should start a venue to play these many works. Here’s a title that came to my mind: FORGOTTEN FEATURES FILM FESTIVAL (FFFF) What do you think? Any takers? Kidding aside, for a lot of filmmakers, actually MAKING a feature, regardless of financial outcome is still an amazing accomplishment. Given that it’s tough enough to make a no-budget feature WITH MONEY – sorry to hear that you (and others) had to sacrifice so much to get a budget. In this cultural wasteland, you have to be incredibly willful to do this particular art form (how do people go from ONE feature to the next, and on to a career!!). To be an artist in American culture means that you have to plow ahead without much of any economic support (aside from the few NEA grants or local ‘film society’ funds). And without normal people’s understanding or support for what we’re doing (ART) with our time and resources, it gets even tougher. A now-deceased friend of mine and great writer/director from former Yugoslavia, Franci Slak, used to get his features funded by the state. And after making one, he was put back on a list of a few hundred filmmakers, so he would be funded again for a new work (with the equivalent of a couple hundred thousand dollar budget). The US doesn’t honor its artists like even the smallest country in Europe. So it takes real guts and craziness to go against the flow and make our works, somehow fund ourselves over and over again through the years. In any case, all those many thank-you notes for my book gave ME the needed positive energy to keep working against the odds (THANKS AGAIN!) So the inspiration worked both ways. Aside from the book, you’ve done quite a lot of work over the years. Can you tell us a little bit about how you got started making movies? Nowadays I make movies through my Feature Workshops, collaborating with others who want to learn my approach, which is mostly improv and experimental, with a focus on real people and their personal stories and ironies. Aren’t there enough Hollywood movies being made that tell a simple story with known actors? We should be making movies that we can afford, with our personal resources and groups of friends, that are original and unique in every way. It’s the best approach, I think, for an indie producer, as we head into 2010. As crazy indie writer/director, it’s not worth playing their game their [Hollywood] way. And if the features we make don’t get in film festivals…who cares? The programmers may not be smart enough to get it. Once, when I had a big walkout from a screening, an artist friend Mary Ashley asked me, “Rick, what did you do right?” She thought it was a badge of honor for me, as a modern artist, to shock an audience and send them running! In the 1990’s we could still get in good film festivals (it’s a lot tougher now, don’t you think?). I guess I have to believe that NOW IS THE REAL FILMMAKING REVOLUTION. I think that’s true because there really is NO PRESSURE to make something that could be called a ‘commercial’ movie. Even hideously expensive Hollywood movies can barely get a screen for longer than a week. So when we make our weird indie features, for the lowest budgets possible ($30 for three hour-long Mini-DV tapes, etc), the only constraint we have is being totally honest to our own intuition and urges. We even got a Dogme movie, Chetzemoka’s Curse (Dogme #10), that’s probably one of the first features made completely in the new millennium – shot & completed it during 10 days in January, 2000 through my Feature Workshops. And it’s probably one of our best ones! Anyway, we have no one to answer to but ourselves and our personal standards of excellence. I’m hoping to see some amazing works on websites and on YouTube. Before I made my first feature, I remember thinking I couldn’t make a feature because I didn’t have money for film processing. Or I didn’t have an audio recorder. With new High Definition technology, do you find filmmakers have less excuses and an easier time making features? Yes…and no. We have less excuses, but if we try real hard we can still make it appear impossible! If you’re the kind of person who thinks they need all the best equipment and crew, real movie stars and a real budget, you’ve still got the problem. For some, the excuse will be that a RED HD Camera is $1500+ a day and too expensive to obtain. We are great at making up excuses, even when there aren’t any left. Art is risky! We are scared that we may reveal just how unskilled and stupid we secretly think we might really be. But the alternative is worse. If we don’t ever take the risk and try, then life is just a pretty big boring mess where all we do is work to pay bills and there’s never enough money for anything anyhow. Some school near your house probably has a DV class where you can get your hands on a 3-chip DV camera. And there are other creative people around who just need to read the right Craigslist ad to get in touch with you to help with your feature. In the Bay Area/Oakland/SF area where I now live, there are hundreds of good actors on sfcasting.com hoping to be cast for an unpaid part in a movie so they can add to their reel. These actors are growing their own careers. That’s what we filmmakers need to do! For me it’s important not to let too many years go by without creating a new movie (I can feel the stupid blocked energy building up in my head…). If there’s absolutely no money, then you need to sell something (a used-car?) to jump-start things. Nowadays, a car of even the cheapest kind can generate a lot of DV hours of stock, along with some rental dollars for a good camera (DVX100b, or?). And as you ramp up for the shoot, read some of Boston University professor Ray Carney’s articles, interviews and mail to get inspired. In your book, you emphasize having a strong vision for the kinds of movies you want to make. What are your thoughts on keeping the momentum going when the going gets tough? If we’re talking ‘artistic vision’ then that means (to me) that each person needs to just jump in and try to make a feature or short movie without worrying about doing it ‘correctly.’ Shoot it YOUR WAY, edit it YOUR WAY, and you’ve achieved YOUR STYLE. In other words, don’t listen to what anyone else says or thinks. The only momentum I know comes from KNOWING you are an artist (in film/DV, oil paint, clay, photograpy, or whatever). What media artists like us do is make movies. So, after awhile, we’re going to make another one. That’s just how it is! When things get tough we have to adapt. That’s what my decision to shoot with a 1:1 ratio represents. And like I mention in my “Extreme DV” book, I met a guy who re-recorded over the same Sony 1-hr. mini-DV cassette 30 times (capturing his footage into Final Cut Pro after each shot roll) to make his feature. Total cost = $7 (plus a borrowed DV camera). Don’t let the doubters wear you down. If you wait for the ideal production situation you’ll never get started. I know from my projects, sometimes you want things to go a certain way, but they just don’t. The FX guy shows up late. The location falls apart. Some members of cast and crew leave the show for a higher paying gig… How do you recommend filmmakers stay flexible? My little mantra is – “EVERY PROBLEM IS THERE TO MAKE THE MOVIE BETTER!” So no matter what’s thrown at you, you absorb the punch and go on (think gung fu). Go get a better actor after the first one disappears. My Emerald Cities had that kind of major problem. The actress, Carolyn Zaremba, moved to New York City to pursue her acting career before I could finish up my dragged on shoot (over more than a year of slowly attaining funds for more 16mm and prosessing). So I ended up appearing in the flick myself, in her place (you’ll have to see the movie to see how I did this. Emerald Cities is available at Netflix! A few years back, you told filmmakers to stick with a 1:1 ratio. That is, in production you should only shoot a scene once. Has this thinking changed with digital? I mean, if you ask me – it seems like digital can often make the days go longer. While that strict FILM shooting ratio seems no longer essential for saving money for a DV movie (was essential when shooting film; just 11 minutes of 16MM costing upwards of $500 when you cover stock, processing, workprint, sound transfer, etc), it still makes for a better (DV) movie if you proceed in a super-focused manner, taping limited takes that must be accurate enough to keep the story moving forward. Could you tell us a little bit about your Feature Workshop? At my Feature Workshops I work with participants to shoot and edit-to-completion in 10 days. So we make a feature in a week and a half. Wait… So you have a workshop where everyone collaborates to complete a feature in 10 days? That’s amazing! And just about each of the 17+ features we’ve produced this way have gotten in at least one international film festival. For six years in a row, a Portugese festival, Figueira da Foz International, flew me (or a participant) into Lisbon for an all-expenses-paid festival screening. Pretty cool reward to all the work. At any rate, I’m proud of the features we’ve produced in this manner. What final advice do you have for filmmakers who have not yet made a feature, but want to? Bite the bullet and somehow get your hands on a good DV camera/Panasonic DVX100b would be nice!. Maybe an ad in craigslist.org will get you a great collaborator / co-producer/ cameraperson with the gear. Then, get/advertise for a soundman/soundwoman (w/Sennheiser 416 mike, or some good mic & mixer). Don’t let the lack of money distract you. ONLY if you believe…can this come together. When I was in this state of activity (being an artist inspite of having NO money) my kindly landlord let me go 8 months without paying rent (see full story in Preface of my Feature Filmmaking at Used-Car Prices book). The universe sometimes makes an adjustment for an artist like you! And if you’re not a writer, you can still build a story AS you shoot (see my Extreme DV at Used-Car Prices book for how this improv approach can work). So my advice is – sell that used-car and BEGIN! UPDATE: As special offer for Filmmaking Stuff readers… If you sign up for Rick’s August 2010 Feature Filmmaking Workshop you’ll get 50% OFF the enrollment fee! NEW UPDATE: Just got word from Rick. He said spaces are filling up FAST and there are only a few seats left! If you want to participate and make a feature this summer, send Rick an email ASAP and reserve your spot.